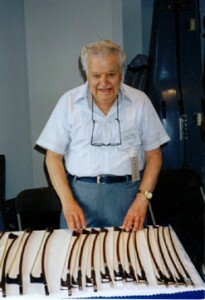 The Samuel Kolstein Violin Shop was founded by Samuel Kolstein in 1943 as a Violin and Bow making establishment in Brooklyn, New York. Over 60 years later, Kolstein’s has built a proud reputation for quality, craftsmanship and expertise in both the manufacture and repair of a whole range of stringed instruments, and has expanded to a staff of twelve experts in restoration, marketing and production. Mr. Samuel Kolstein was a primary bow restorer for the Wurlitzer establishment from the late 1940’s through the mid 1950’s, performing bow repair, restoration, and duplication for the famed Wurlitzer’s “who’s who” clientele. Mr. Kolstein also conducted his own shop business of fine making and instrument restoration with an international staff of luthiers. 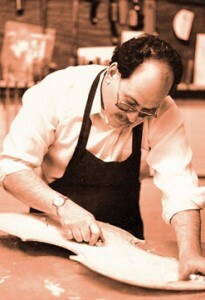 In 1958, Samuel Kolstein Violin shop relocated to Merrick, New York, on Long Island with Samuel’s son Barrie Kolstein joining the shop in 1971. The parent corporation and manufacturing division that specializes in Kolstein product development, manufacturing, and worldwide distribution. Samuel Kolstein & Son, Ltd. The fine arts division dealing with sales, manufacturing, restoration and rental of string instruments and bows. The two companies had offices and facilities in Bellmore and Merrick, New York. In 1980 the Kolsteins relocated to their present address at 795 Foxhurst Road, Baldwin, New York. Samuel Kolstein & Son, Ltd. has greatly expanded it staff and facilities since the relocation in 1980. An international staff of expert restoration artists, all working under the supervision of Barrie Kolstein, cater to the requirements of the upper echelon player as well as the demanding needs of the aspiring student. Samuel Kolstein & Son, Ltd. has made a commitment to Musical Education throughout the world, supporting youth orchestras, lecturing, and expanding our educational division under the guidance of Mr. Kolstein and Mr. Jacob Cralidis. In September 1999 Kolstein & Son, Ltd. opened a new facility, adjoining our present location, to house the newly expanded Kolstein Educational Division.